RAPID CITY, S.D. 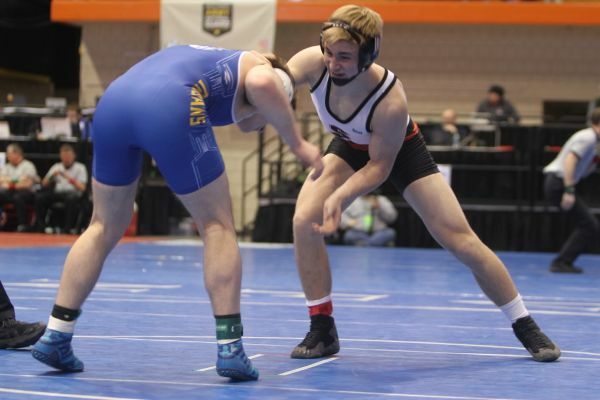 – The Friday afternoon session at the State A Wrestling tournament is in the books. Sturgis had Kaden Olson advance in the 106 pound bracket as he defeated Brock Sparks of Mitchell 8-0. He’ll face Quincy Hulverson of Tea Area in the semifinals. Jacob Wood is also moving into the semifinals with a win over Hayden Shaffer of Pierre. He will face Watertown’s Ty Althoff at 120 pounds. Logan Desersa of Sturgis dropped his afternoon match to Jacob Moore of Aberdeen Central and will move to the wrestlebacks. Reese Jacobs also dropped his afternoon match to Tyson Stoebner of Lennox in a 13-6 decision. He will move to the wrestlebacks. Wren Jacobs won his afternoon match with an 8-2 decision over Alec Bien of Milbank. He will wrestle Will Jarrot of Aberdeen Central in the semifinals at 160 pounds. After dropping first round matches, some Scoopers were in wrestlebacks Friday afternoon. Tice McVay won his wrestleback at 195 pounds over Mitchell Klinkenborg of Dell Rapids. AT 182, Taylor Coffield won his wrestleback over Trevor Sagness of Sioux Falls Washington 9-5. At 170, Carl Nash won his wrestlebck with a 6-3 win over Toby Scheck of Milbank. At 138, Perry Ketelson defeated Jackson Wilson of Douglas with a 5-3 sudden victory. And, at 113, Evan Osborn won his wrestleback with a 6-4 victory over Sorenson Aadland of Harrisburg. Other area wrestlers winning their quarterfinal matches were Jack SChoenhard of Stevens at 106 pounds, Cael Larson of Central and Landen Fischer of Stevens at 113, Logen Fischer of Stevens at 120, Declan Malone of Stevens and Max Sailor of Spearfish will meet other in the semifinals at 132, T.J. Morrison of Central at 145, Cooper Voorhees of Stevens at 152, who will meet Colton Jackson of Douglas at 152, Nate Allen of Stevens at 160, Wyatt Jungclaus of Central at 170, and Evan Hehr of Spearfish and Nolan Smith of RC Central at 220.